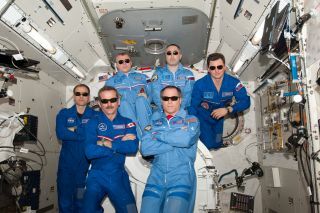 The International Space Station's Expedition 34 crew pose for a team portrait with sunglasses. Pictured on the front row are NASA astronaut Kevin Ford (right), commander; and Canadian Space Agency astronaut Chris Hadfield, flight engineer. Pictured on the back row (from the left) are NASA astronaut Tom Marshburn, Russian cosmonauts Oleg Novitskiy, Evgeny Tarelkin and Roman Romanenko, all flight engineers. Six astronauts living in space may not have gravity, fresh food or a shower, but there is one Earth necessity they won't miss Sunday: The Super Bowl. NASA's Mission Control at the Johnson Space Center in Houston will beam the Super Bowl XLVII showdown between the San Francisco 49ers and the Baltimore Ravens live to the International Space Station so its astronaut crew can watch the big game along with every other football fan on Earth. "Yes they are going to watch it this weekend," NASA spokesman Josh Byerly told SPACE.com in an email. Byerly said Mission Control made a special point on Friday (Feb. 1) of asking the station astronauts if they wanted to catch the game. "And they said they definitely wanted to see it," Byerly said. Whether the space station crew will throw a traditional Super Bowl party, hold a zero-gravity football game, or just float around with the game on in the background is unknown. But the International Space Station, is just about the same size (tip to tip) as the football field the 49ers and Ravens will play on in New Orleans during Sunday's game. The International Space Station's length and width is about the size of a football field. Space travel seems to be taking a spotlight in the Super Bowl this year. Car manufacturer Kia will debut its new "Space Babies" TV commercial for the Kia Sorento, in which a father tells his young son that all babies (even animal tots) actually come from the alien planet Babylandia, and launch on epic space missions in order to reach their parents on Earth. Just after the Super Bowl, the AXE personal care products company is expected to unveil the first winner of its AXE Apollo Space Academy contest to launch 22 people on private trips to space. The contest was announced in January, with AXE teaming up with XCOR Aerospace —builder of the private suborbital space plane Lynx —and cosmic tourism firm Space Expedition Curacao to offer the trips. The other 21 winners from the AXE Apollo Space Academy are slated to be selected after a final competition — the AXE Global Space Camp — to be held in Orlando, Fla. The winners will then be launched into space, one at a time, once XCOR's Lynx space plane begins operational flights with Space Expedition Curacao, contest organizers said. The contest is open to both men and women in more than 60 countries. Entrants must sign up at the AXE Apollo Space Academy website (AXEApollo.com) and write about why they should fly in space. Website visitors will then vote on the entries. The deadline to enter is Feb. 3 (Super Bowl Sunday). You can follow SPACE.com Managing Editor Tariq Malik on Twitter @tariqjmalik. Follow SPACE.com for the latest in space science and exploration news on Twitter @Spacedotcom and on Facebook.